Brevity, Humor, Photos. Ok here we go! 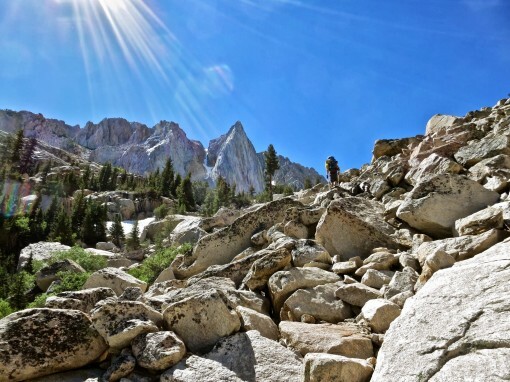 The springs moan as Adam navigates his Malibu around another steep curve going up Sonora Pass. Vitality keeps my mind off the road with jokes from the back seat. We’ve managed an early start to a three day weekend and I couldn’t be more thrilled. Two months of running have left me itching to climb outside. The Incredible Hulk is the perfect place to jump start my summer climbing season. Another beautiful day at the Hulk! Adam has signed on to play rope gun and I’m along as the tour guide. I’ve got un-finished business all across the Hulk and we are here to try and slay those daemons. After the mandatory wind sucking approach we find the hulk nearly empty. Cold weather prompts a leisurely lunch and we start up Sun Spot Dihedral a touch after eleven. Luke makes a cruxy reach on P3 of Sunspot Dihedral. 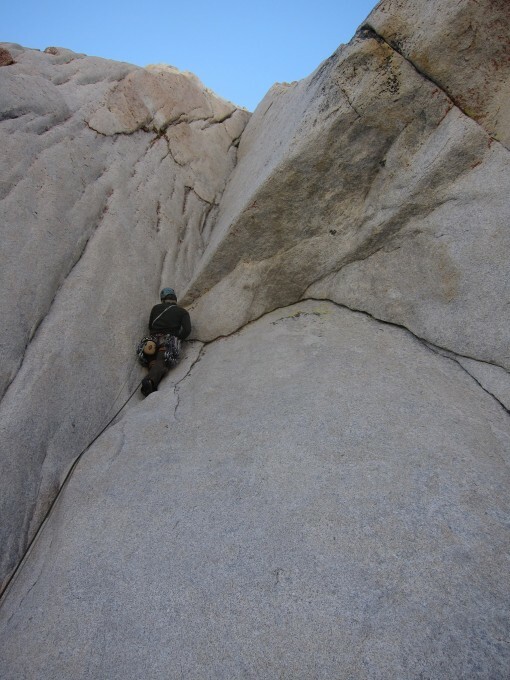 The granite bites into my soft fingers and we romp up the first few pitches. Adam calmly dispatching the pumpy underclings and spooky corner on Pitch 3. I’m feeling a bit anxious as I slot in nut after micro-nut on pitch four. On a previous visit I ripped off a large hold n this pitch and we had bailed, bloodied and defeated. Adam follows the amazing 4th pitch. Meter after meter my forearms taunt me and threaten to release. The anchor, so far away at first, finally is within reach and I’ve done it. We keep swinging leads and make it through the next few pitches before rapping off down Solar Flare. We hoot and holler across the face at Hamik and Vitaily who are rapping down Blowhard. An aversion to cold leads to another leisurely start which is the cherry on top of our long night of sleep. The masses have come out of the woodwork and the conga line will grow to 7 parties on Positive Vibrations. Luckily Adam and I have chosen Tradewinds and don’t have to worry about the crowds. The starting corner appears casual but packs quite a punch and denies Adam the onsight. I barely squeak my way through trying desperately to remember sequences from three years prior. After the brutal warmup we get into a grove and swing pitches with Adam leading the spicy ones. Adam leads the 6th pitch. Luke gets psyched for some thin laybacking. The weather on the middle section of the hulk is amazing and I wonder why Tradewinds isn’t more popular. 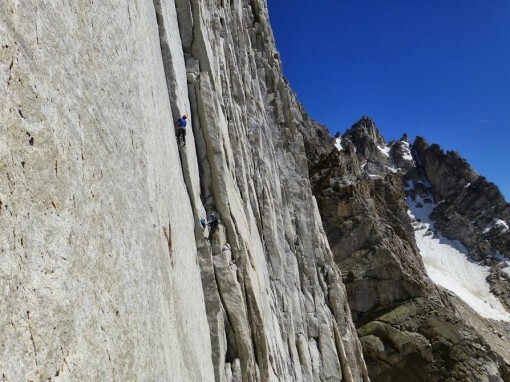 I strip down to a T-shirt and set off on the first of two crux pitches. My confidence wavers and I still end up hanging and falling a handful of times. But upon reaching the last bolt I filled with laughter. 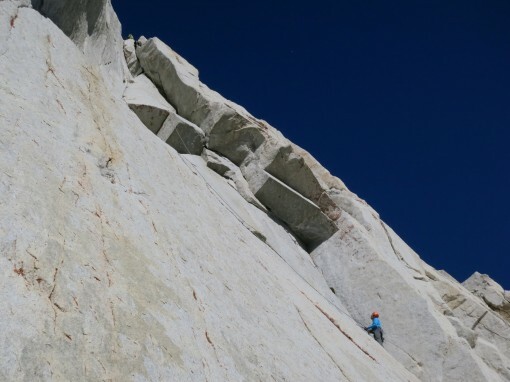 A great SuperTopo trip report comes to mind: If you like Off Width, You’ll Love Tradewinds on the Hulk As I dyno towards the jug, below the belay, I’m glad that I love offwidhths! 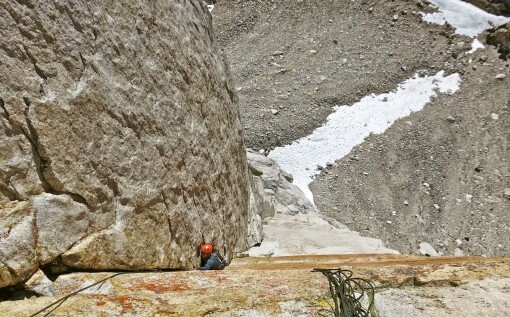 Luke on the first crux pitch. Adam contemplates the all points off dyno to the belay. Fulfilling his duty as rope gun Adam sends the first crux on follow and swings through for the last hard lead. Thin laybacking is the name of the game and he makes quick work of the pitch, a great showing of fitness. A stream of people has been rappelling down the Venturi Effect and we squeeze our way up between parties. It takes 100% commitment to dig my fingers into the thin seam and layback to victory. Adam laybacks up the last pitch on Tradewinds. 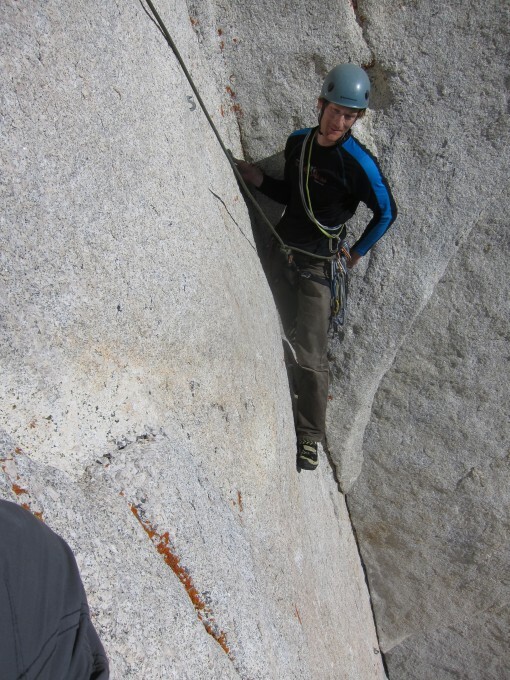 Adam leads the final pitch up into the Venturi. Plenty of daylight remains as we join the stream of climbers rapping down the face. Back at camp we savor the tales of the day hanging out with new friends under the supermoon. We take no pictures the following day as cold winds and occasional rain drops chase us off the polish route. On the hike out I’m already making plans to go back. Adam is hooked too and I’m sure we will be roping up again shortly. The next weekend couldn’t come soon enough and magically I’ve found another partner for the Hulk. An email showed up from a good friend checking to see if I was free. His friend, Sam, an acquaintance I was soon to make, was looking to get on the Venturi Effect. In Bridgeport I overhear Sam talking to his significant other, assuring her that he would be safe and that I was an experienced climber. It sounded like an echo of the conversation I had the night before. It takes a lot of trust to climb with new people and Sam and I were lucky enough to get along almost instantly. The weather couldn’t be more different than the week before and we fry on the hike in. We meet lots of people heading out who are all raving about the bugs. Polly, a friend of a friend, even gives us a can of bug spray to help defend us from the madness we are about to encounter. I’ve never seen more mosquitoes and we spend the rest of the day trying to avoid them and the piercing sun. We get a 5am start and despite the early hour are easily climbing in T-shirts on the first few pitches. Sam takes the sharp end until pitch five and does a great job on a series of difficulty leads. He is not pleased to have fallen more times than his past ascent but I’m impressed by his climbing. I manage to just squeak by pitch after pitch on follow. The Book of Secrets is a blur of tips locks and pump. Sam chills out on the Book of Secrets. 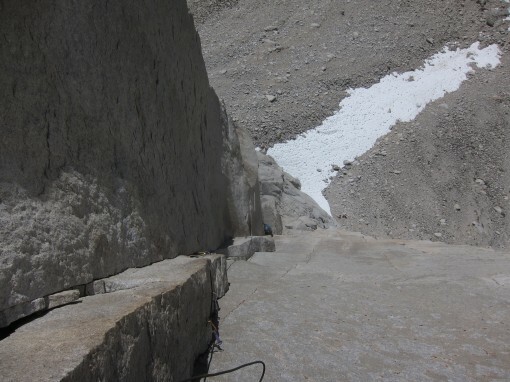 I’m determined to lead a few pitches and I take over the sharp end as we get onto the amazing headwall. 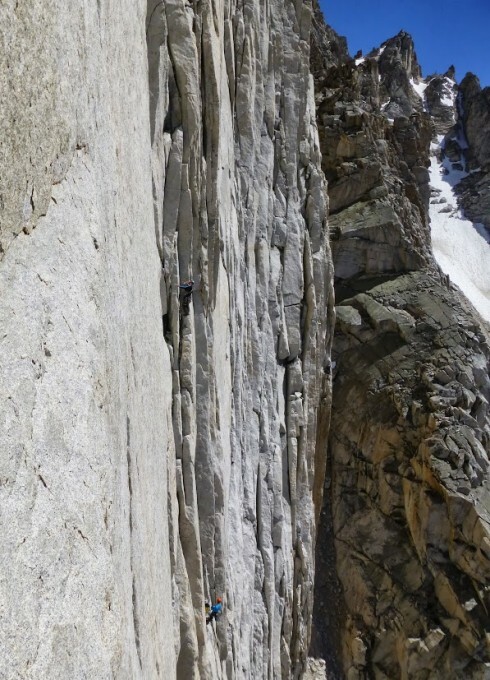 The first 5.12 pitch goes well as I hang only a few times to figure out a tricky sequence. With running beta Sam easily follows clean and I charge off on the next pitch. Sam follows the bouldery 7th pitch. The climbing is phenomenal with shorty tricky sections split up by good rests. The crack starts pinching out and soon enough I’m cruxing below a 1/4″ bolt, unsure how to make further progress. Yet again it takes me a few hangs before I’ve figured out the right sequence and make it to the bolted finale. The crack closes out completely and I’m faced with a series of grooves and pinches. Lackbacking is the name of the game and I try to sprint up past the next few bolts. All of a sudden the holds run out and I’m faced with a moment of truth. 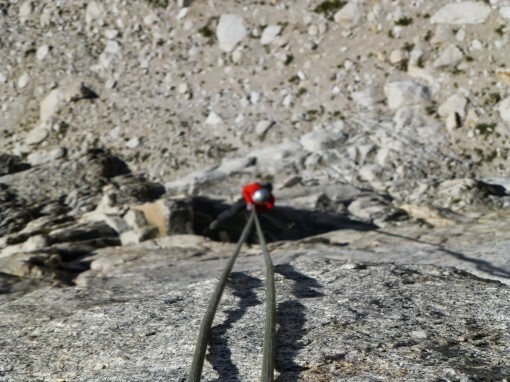 Sam on the long headwall splitter. A steep flared finger crack looms above us which turn a roof and runs wildly up into the Venturi. A smattering of bolts, gear and try hard get Sam up the pitch. Each time he falls off the pitch I feel the lactic acid grow heavier in my arms. We’ve done three 5.12 pitches with a smattering of 5.11 and it is finally taking it’s toll. 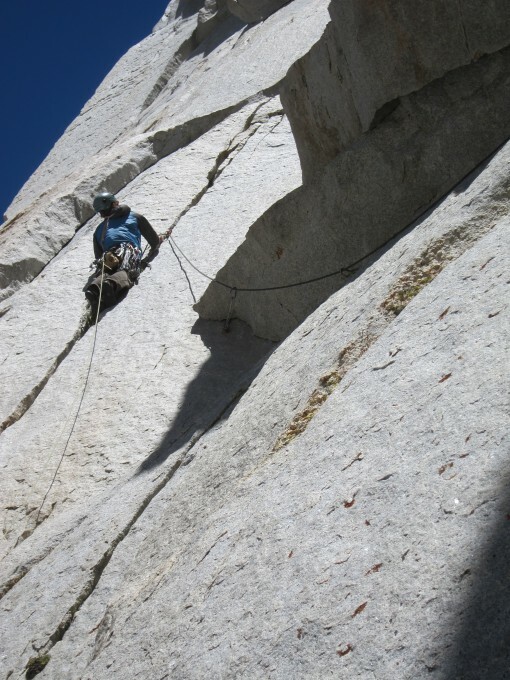 Luke fights up the steep ninth pitch. 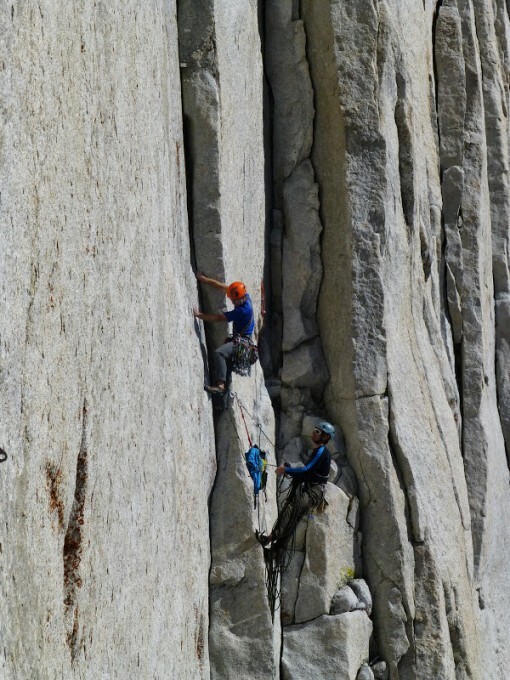 Neither of us send the pitch clean but the climbing is out of this world. It is the definitive crux pitch for us and the challenge keeps our psyche high. I take the lead for our final pitch and barely make it thought the tips laybacking. We have joined up with the final pitch of Tradewinds and the familiarity helps me send. Soon enough we are both sitting above the Venturi chimney contemplating the past hours of adventure. It is one of the hardest climbs we both have ever attempted and it went shockingly well. Neither of us expected a send and now the numbers and features on the topo have more meaning. We imagine Peter Croft, well past 50, styling the route. The next day Sam hikes out to make the long drive to Denver and I replace a few 1/4″ bolts and tat on Tradewinds. I’m back to the infatuation stage with the Hulk and can’t stop thinking about all of the amazing pitches. Sam and I both know that the route will draw us back to the Hulk. It seems like I just can’t get enough!